Ah yes, Kermit the Frog, where would our lives be without that fuzzy muppet? Well, I’d be completely off topic, that’s were, because he’s not our topic today. Nope, you see, when dealing with comic books most folks will automatically think of Green Lantern (or Green Arrow, I guess, though honestly I’ve never met ANYONE who would say Arrow first). In this situation it’s the original, 1940s Green Lantern, Alan Scott we’ll be focusing on in that titanic issue, All Star Squadren Annual #2. This is actually a pretty good story, and as an added bonus, includes artwork by some Golden Age greats such as Wayne Boring, Mart Nodell and Carmine Infantino. It has the feel of a true Golden Age Justice Society of America adventure as the team breaks up into groups to combat an oppressive enemy from the future. 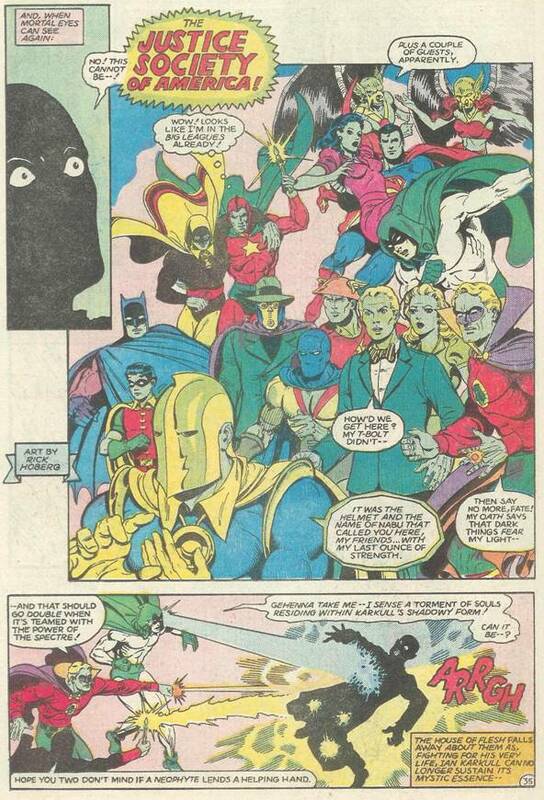 And, of course, a truly green Green Lantern, as you’ll see on page 8 below. Truly bizarre, eh? Some odd quirk here has produced a coloring effect that is not dissimilar to having a really bad LSD trip. It’s funny how Dr. Fate is the only one seemingly unaffected by this. Heck, even Green Lantern’s ring is shooting out an uncharateristically Orange ray (laser rays perhaps?). Anyway, after saving the deathly ill president of the USA (hey, he must be sick, just look at his skin color! ), our heroes interrogate the would-be attackers. And Green Lantern promptly roasts them. Seriously, look at that panel again, it looks like he just flambéd those two goons with his deadly Orange ray. Even the Prez finds it all really, really ghastly. Just look, he’s turned green! Ha ha! – Uh, anyone? Get it? It’s a joke. Ah, forget it! 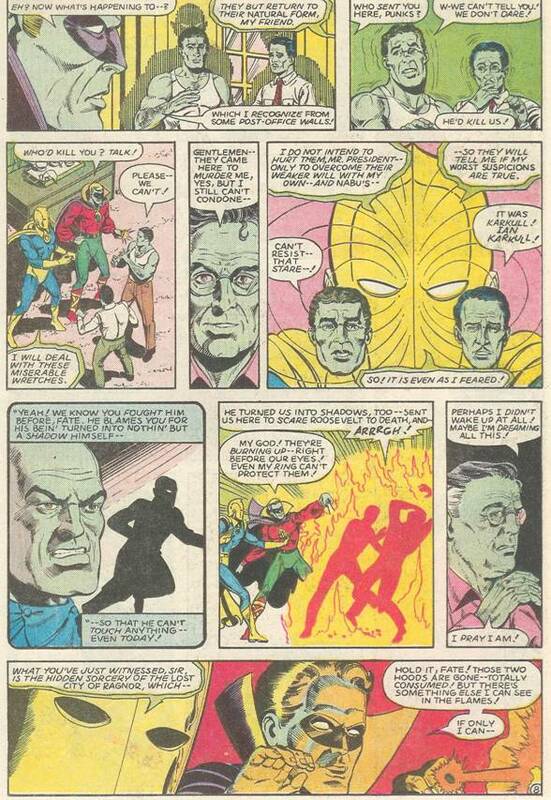 Anyway, our heroes succeed in their missions (except for Green Lantern, funny how that worked out) and encounter the mastermind of the whole affair! Good lord! It’s an epidemic! Just look at Batman and Robin! At Superman and Lois! The Hawkman and Hawkgirl! These people need medical attention STAT! Wait, at least the Spectre is okay, he’ll set everything right! Go Spectre Go (insert Ultraman music here)! Or maybe not. 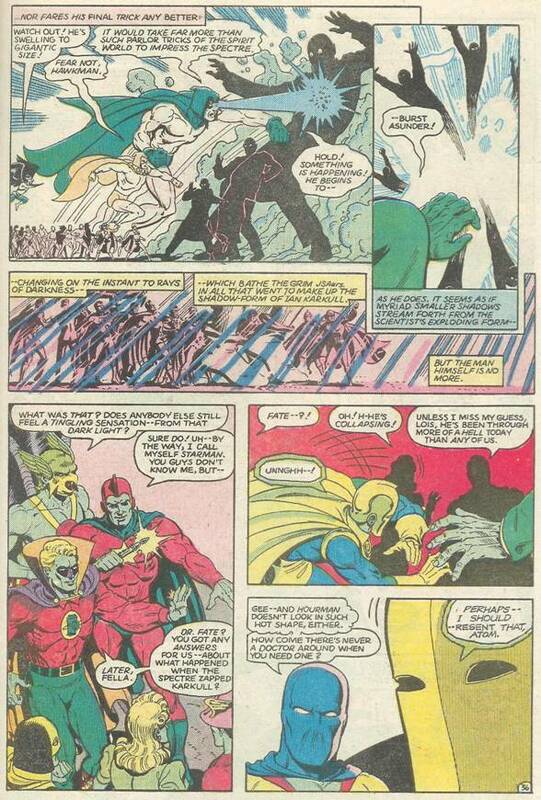 How odd that such super-powerful characters don’t even notice the horrible green sickness enveloping them. I mean Dr. Fate, come on, you’re a Doctor for peat’s sake! Unless you’re one of those nasty Ph’ds who like to say they’re doctors but have no medical knowledge. That’s just dishonest! Of course this was only a printing defect, either that or the colorist was having a real bad trip. Regardless of the situation, it’s good to know that even superheroes sometimes are green with envy for each other… yeah, the joke’s getting lamer each time I use it, guess that’s the cue to say till next time!